WESTPORT — With a median home value at $1,061,000 and median household income of $159,894, Westport is home to a plethora of luxury cars, many of which could cover a student’s entire college tuition. According to Town Assessor Paul Friia, there are an estimated 23,206 vehicles assessed at $321 million, in the 2015 grand list. However, Friia said the numbers need to be put in context given the fiasco that is the Connecticut Department of Motor Vehicles. He noted the numbers are “at best estimates” following the software conversion the DMV instituted last August. The 2014 motor vehicle grand list totaled $323 million. John Seo, principal at Fermat Capital, owns the priciest car in town, a 2015 Ferrari FF costing $205,990. 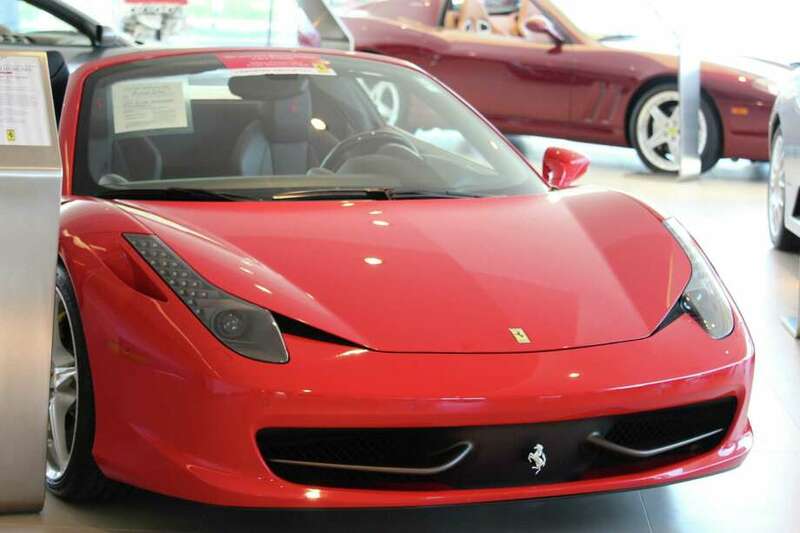 Two 2015 Ferrari 458 Spiders rounded out the top three with a price tag of $193,305 each. Among the top 50 vehicles, Ferrari was the make of choice on the list with 12, then eight Mercedes, seven Bentleys, six Maseratis, five Porsches, four Aston Martins, two BMWs, two Fords, two McLarens, a Land Rover and a Rolls-Royce. “Two popular Ferraris around here are the FF and the California T because they have all wheel drive and a good size trunk, allowing them to pick up kids get groceries and also go to the race track,” said Carter Kramer, marketing specialist at Miller Motorcars. “The California T is also popular because it has a retractable hard top and is painted so it looks like a coupe. It’s a perfect summer type of car also capable on the racetrack,” Kramer said. The Ferrari 458 Spider, which was the second most expensive car in town, is more driver focused, according to Kramer. “They go to the racetrack more. It’s only a two seater,” Kramer said. All six Maseratis that cracked the top 50 were GranTurismos. “The Maserati GranTurismo is a wonderful car. It’s sporty and luxurious, sounds great, has an Italian v8—that car absolutely roars. It also has four seats, so it’s extremely usable for the kids,” Kramer said. The Porsche 911 proved popular with Westporters because all five Porsches on the list were 911s—four Turbos and one Carrera. “The 911 comes in many different variations from rear wheel drive to all wheel drive. The 911 Turbo is the cream of the crop. You can do zero to 60 in under 2.9 seconds and they are equipped with 540 horsepower,” said Nick Coclin, sales professional at Porsche of Fairfield. The turbo is really the top model of the 911 range. It’s a status symbol. It’s been out for 51 years now and can go up to 205 M.P.H.,” Coclin said. 2015 was the best sales year for Porsche as they sold 40,000 units in the United States, according to Coclin. While the Macan and Cayenne, both SUVs, account for around 70 percent of Porsche’s sales in the U.S., 911s make up 10-11 percent. As for the other end of the spectrum, John Lomartire’s 1986 Mitsubishi Galant is assessed at $470. A $500 MG MG2 from 1962 places second, tied with a 1964 Morgan Plus 4, also at $500. Richard Dravis, who owns a dark grey 1988 Ford Thunderbird turbo coupe model valued at $860, says he really enjoys driving the car around town as well as on the highway. Dravis and his wife, Carol, bought the car in 2003 and despite enjoying the car immensely, say one negative is that replacement parts are very expensive and hard to come by. “We’ve enjoyed the car greatly but its become very hard to get parts for it. It’s a great car, fairly good gas mileage—it gets 25 on the highway and 20 in the city,” he said. Dravis also owns a 1973 Ford Ranchero with a large v8.